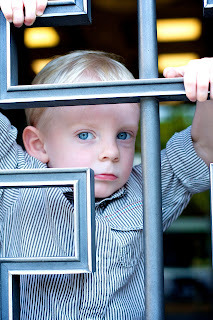 Rambles and Ruminations: Caleb is 3! Caleb turned 3 today and we have gone to Curacao to celebrate. He'll get lots of sun, sand and hammock time as befits an on-the-go three year old who seldom finds time for quality rest and relaxation. We took cupcakes to his school where he wore a birthday crown and was sung Feliz Cumpleanos. His teacher asked me if we celebrated turning 3 with a trip to a Caribbean island, what in the world would his gift be when he turns 18!! Only 15 more years until we find out. When Caleb was born, our lives changed forever. We became people our younger selves would not have recognized who delighted in reading board books, playing enless games of peek-a-boo, learning the lyrics to every song Disney ever composed and generally making fools of ourselves trying to encourage smiles and giggles from our little boy. He is joy personified and we are lucky to be his parents. A Caleb-filled future looks brighter than we ever imagined and we are eagar for it's unfolding. Stay tuned for pictures of Curacao and Caleb when we get home from our Caribbean getaway! What a cute little boy! I adore that last picture of him. Happy Birthday, Caleb! happy birthday caleb! I hope you all have a great time! Happy Birthday Caleb!! I love that pouty pic!! Happy Birthday Caleb from Arizona. I think you should complain that you didn't get a trip to a Caribbean island. What a cutie. His blue eyes are gorgeous! happy birthday to caleb! he's such a handsome little boy. i hope you're having fun celebrating! Caleb! Caleb! Caleb! I also feel that you have blessed my life. I am so happy that you have been here and look forward to evey minute I get to spend with you. Happy birthday, indeed! I turn 33 this year. I might make it to downtown SLC. Alas, no beaches there. Hope your trip is as fun as it sounds. Have a great time in Curacao Caleb. I'm sure that you will find the slavery museum incredibly interesting. Oh yeah, tell your parents to let you swim with the dolphins. I love the pictures :) He has such great eyes! I love how you said that he is, "joy personified." So lovely. Happy Birthday to Caleb!!! I have a Caleb too but he just turned 13. Have fun on your trip! Happy Birthday to your little man! Now the real parenting adventure begins.. Three was tough for me but you seem more together than I am so you will probably sail through it all. If not, you can escape again to the Caribbean, right? Happy Birthday Caleb! You are such a lucky boy to have all these cool adventures at such a young age. You are going to have such great stories to tell your kids one day! So handsome! Happy Birthday, Caleb- and jeez, he's so big!!! Nice going, fwam. Send me some cake. WHAT! Where has time flown to!!!! Oh man Feliz Be-lated Cumpleanos to both your Angels! Is the iPhone and iPod Touch with a telephone? I ask because the Touch seems to get nothing but rave reviews, but I seem a lot of complaints and grumbling about the iPhone.